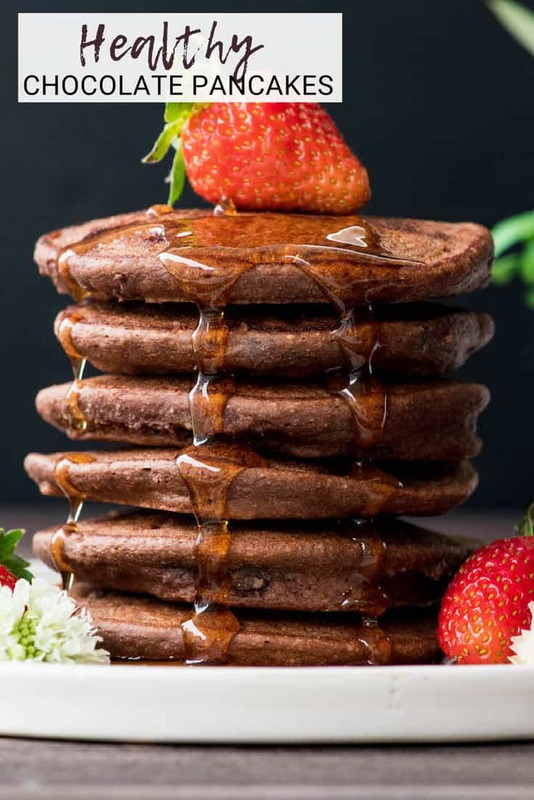 This Healthy Chocolate Pancakes Recipe is a special yet nutritious breakfast that is dairy-free & has no refined sugar! Because chocolate for breakfast is always a good choice! I have Valentine’s Day on the brain in a major way! I think it’s because I am having serious Christmas/holiday withdrawals. For real, I shed a few tears when we took down our tree, I secretly want to watch “A Christmas Story” one more time, and my daughter still plays Christmas songs on the piano…and I totally love it. The anticipation of a holiday is just so fun! Add four kids to the mix and it’s even better! 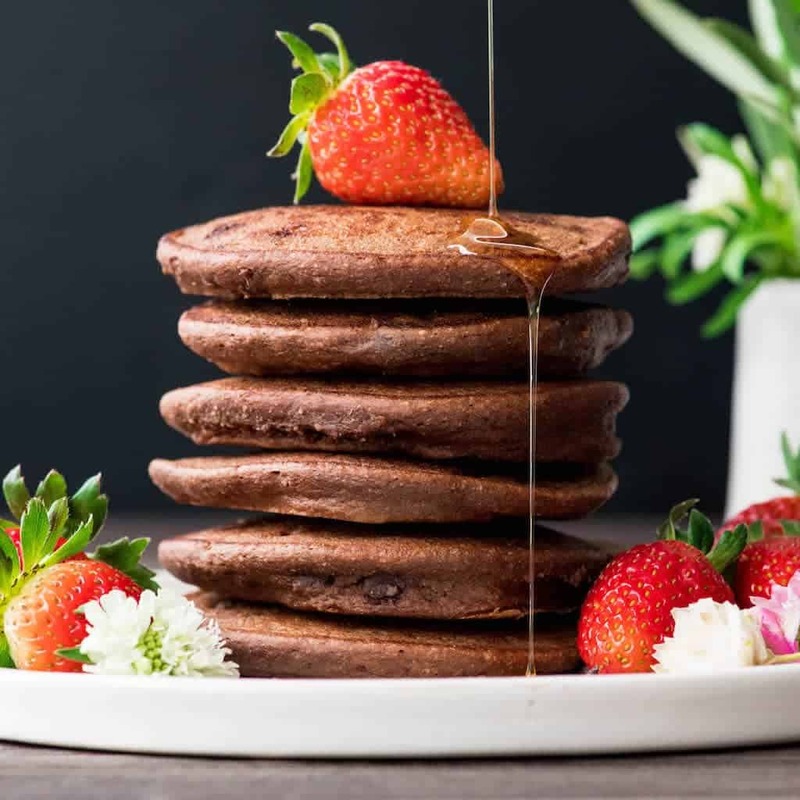 So today we’re making this gluten-free, Healthy Chocolate Pancakes Recipe, which is the perfect Valentine’s Day breakfast! 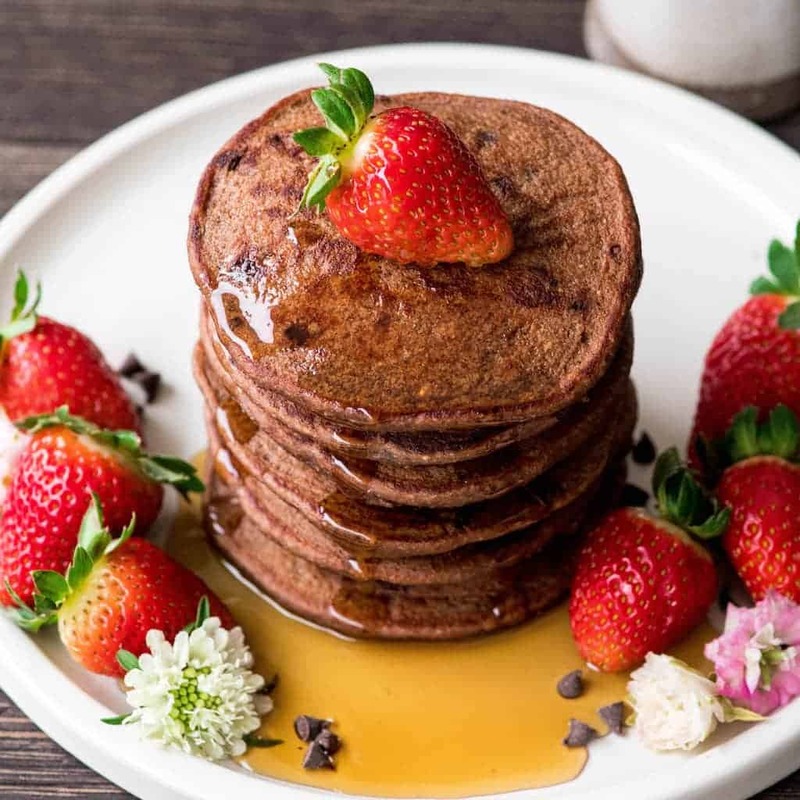 These chocolate pancakes are made with wholesome ingredients like oats, bananas and almond milk, and are gluten, dairy & refined sugar free, but no one would ever guess they’re healthy! 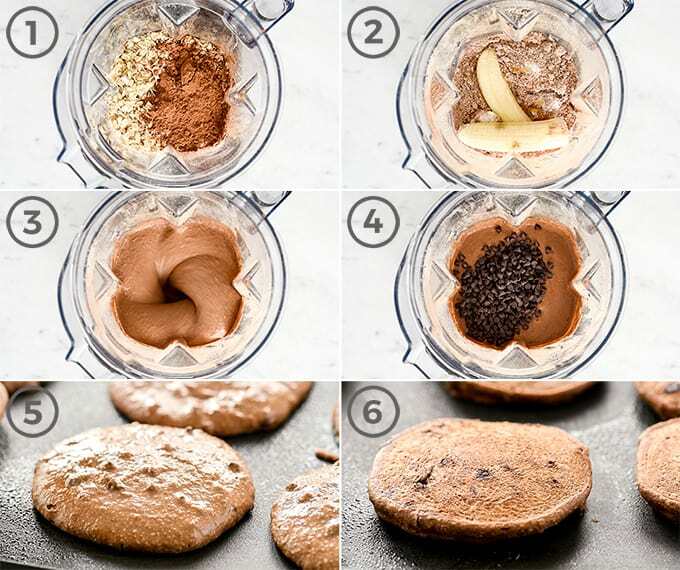 Plus these chocolate pancakes freeze & reheat like a dream, so you can make a batch and save the extras for later! My kids gobble these up, and ask me to make them regularly! Sometimes it’s hard for me to decide what treat I will make for our family celebration! Do I choose brownies, or fondue, or ice cream or…?! Making decisions is SO hard! 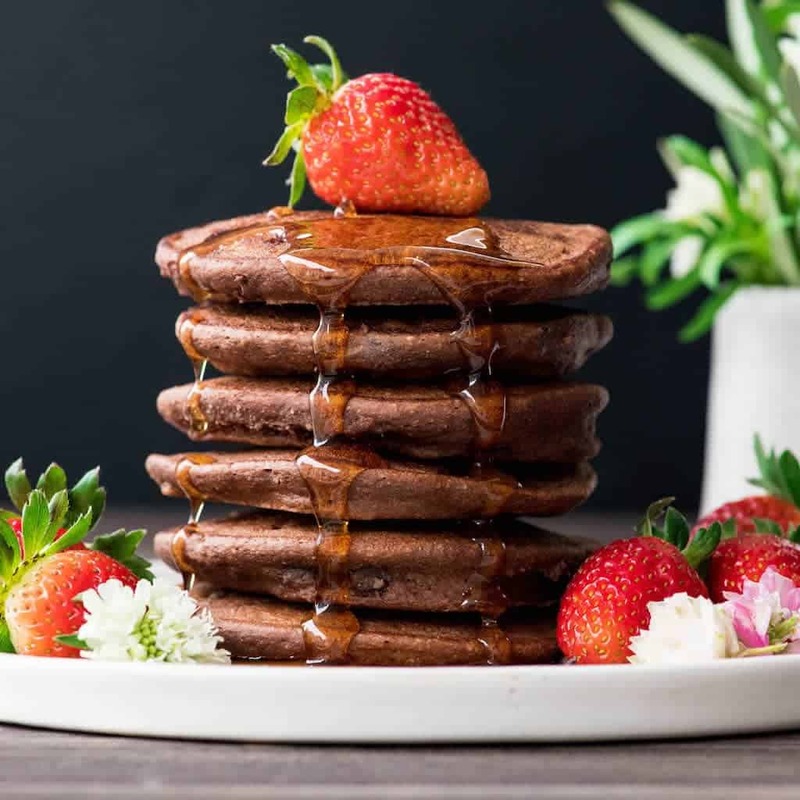 However, choosing to whip up a batch of these Healthy Chocolate Pancakes for breakfast on the holiday that is all about chocolate, is totally a no-brainer! 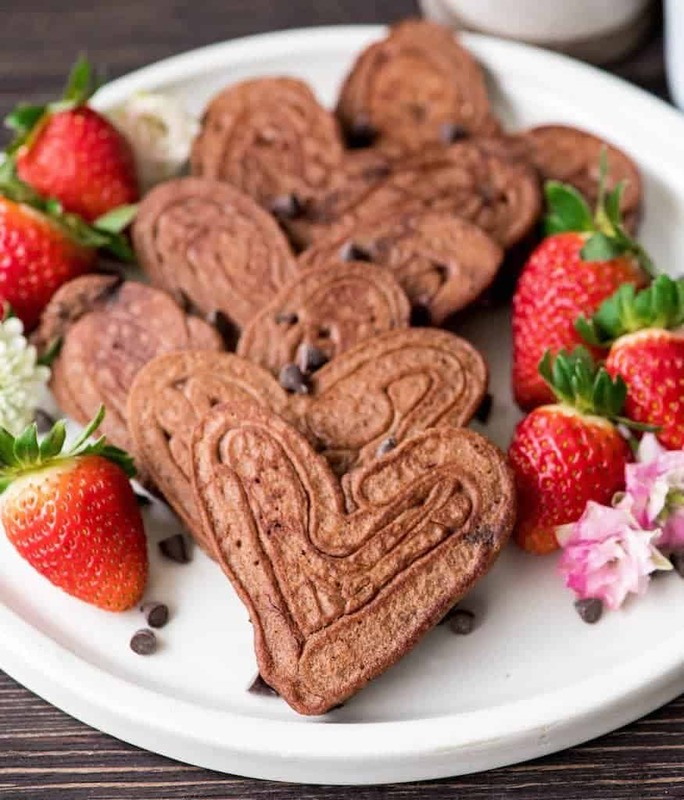 I even made some of this chocolate pancakes recipe into heart shapes! I put the batter into one of these Wilton Squeeze Bottles and just drew the hearts freehand, then filled them in. 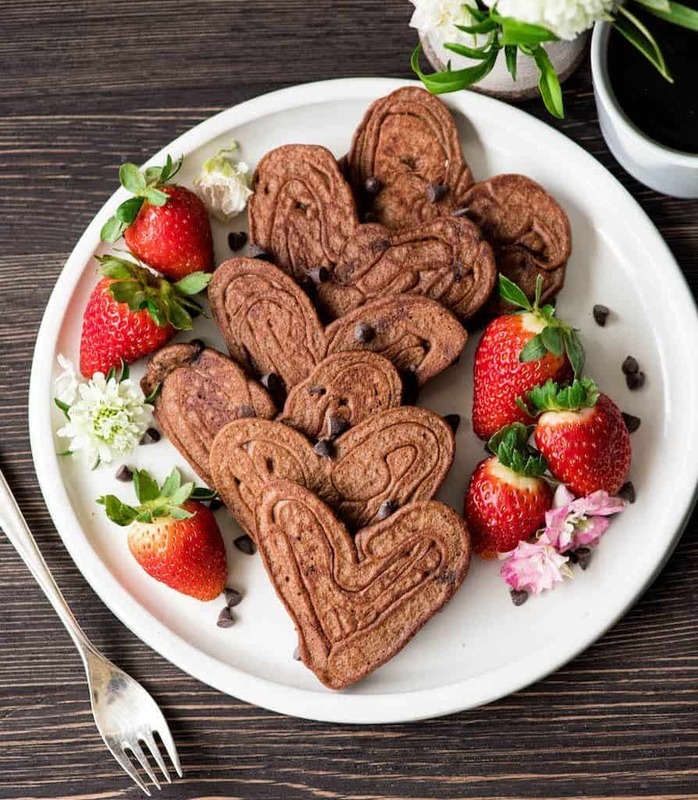 You could use a metal heart-shaped cookie cutter and simply pour the batter into it too! 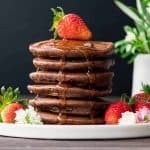 This chocolate pancake recipe is best when it’s made in the Vitamix, or another high-powered blender! It’s super easy to whip up too! Simply toss all the ingredients into the blender and go to town! Here are a few tips to ensure the perfect pancakes every time. Blend dry ingredients first. In order to ensure the oats have reached a flour-like consistency, be sure to blend the dry ingredients first. Then add the wet ingredients! Adjust the amount of milk. I have found that the size and ripeness of the banana used effects the amount of milk needed to achieve the perfect texture. If you like thick and hearty pancakes, add less milk. If you prefer thin, light, pancakes, add more milk! It’s really up to you! Mini chocolate chips. Please, please use mini chocolate chips in this recipe. 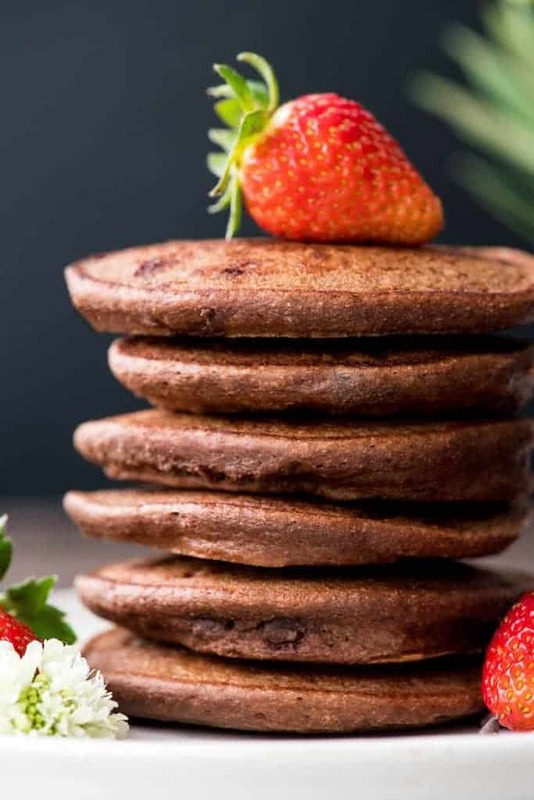 They disperse more evenly throughout the batter, ensuring little bursts of chocolate flavor in every bite! These pancakes are actually super versatile! Here are a few potential substitutions! Honey. Maple syrup or your favorite liquid sweetener can be used in place of honey if desired! Butter coconut oil or cooking spray for greasing the griddle. Warm an electric griddle to 350 degrees F. (medium heat). 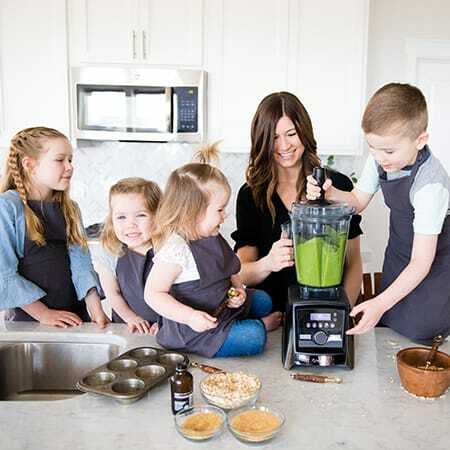 Combine the oats and cocoa powder in the container of your Vitamix (or other high-powered blender) and blend, starting on low speed and increasing to high, until the mixture reaches a flour-like consistency (about 15-30 seconds). Add banana, honey almond milk, sea salt vanilla and baking powder and blend until combined. Add egg and pulse to combine. If batter looks too thick, add more almond milk 1 TBS at a time until your desired consistency is achieved. Stir in mini chips by hand. Melt 1 TBS butter or coconut oil on your warm griddle (or spray it lightly with cooking spray). Drop batter in ¼ cup portions onto the pre-heated griddle, with at least 1” of space between each pancake. Cook on the first side until the edges start to become darker brown and look set, and bubbles begin forming throughout the batter (about 2-4 minutes). Flip and cook on the second side for 3-4 minutes or until it is lightly golden brown. Serve warm with pure maple syrup and fresh berries! These are SOOO adorable; especially those little heart pancakes. And I love the idea of mini chocolate chips for BURSTS of chocolate flavor. You are just making SOOO many good chocolatey delicious treats. Thank you Laura! These look amazing! Just a question-as far as the nutrition facts go, is that for one single pancake? If not, how many is it for? Thanks so much! How many pancakes per amount of the nutrimental table you considered???? The nutritional information listed is for one pancake!